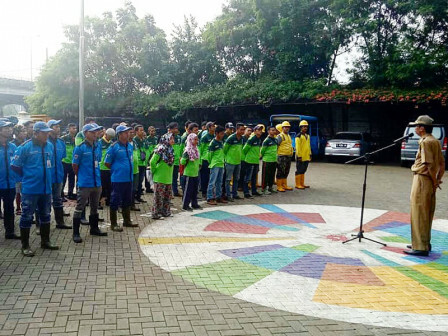 " We must be ready to face them"
80 joint taskforces, held a ceremony for readiness of disaster handling in Jatinegara Sub-district, East Jakarta, Tuesday (11/13). Checking equipment and task division in accordance with the mandates, tasks and functions would smoothen and optimize handling. Jatinegara Sub-district Head, Nasrudin Abu Bakar stated that it was held to equalize perceptions in the face of the rainy season. In addition to inundation and flooding, those taskforces are also needed for handling fallen trees and garbage problems. "We must be ready to face them," he stated. The ceremony itself was attended by the taskforces of Water Resources, Bina Marga, Environment, and PPSU. "When doing the duty, we encourage them to work optimally and prioritize work safety," he said.